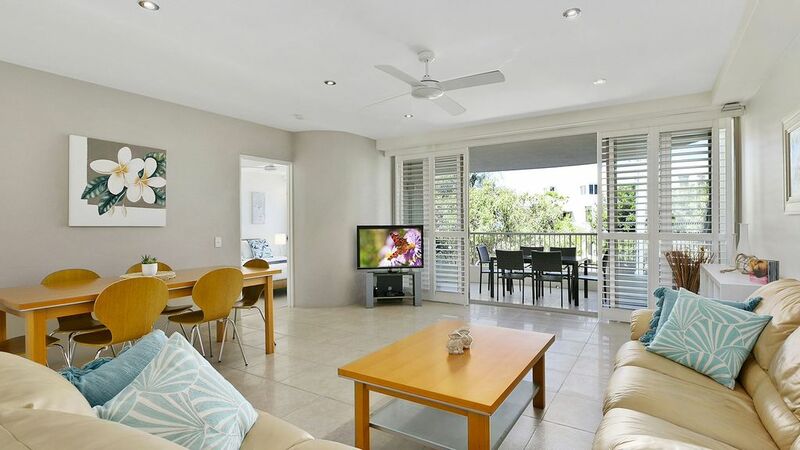 This beautiful apartment is in the ideal location for you to enjoy your next beachside getaway. Drift into relaxation as you enjoy being within a 3 minute walk to fabulous coffee and an easy 5 minute stroll and you will have the sand between your toes. This is a modern two bedroom, two bathroom apartment with refreshing interiors and beachy styling. Only a couple of minutes walk to the Sunshine village shops, cafes and restaurants and to the beach and Surf Club. The large, open, tiled living/dining area is air-conditioned and double-glazed doors streching the width of the balcony. A balcony with outdoor dining and BBQ allows you to enjoy the climate we are so fortunate to enjoy. Facilities include security parking and lift, and this apartment has direct access to the pool and garden. Just step outside your back door and an oasis awaits. The master bedroom has a queen bed and ensuite, while the second bedroom has two singles beds. The main bathroom includes a bath and there is a washing machine and dryer in the separate laundry. Linen and cleaning charges are included in the rate, however to avoid additional cleaning charges please ensure the property is left in a reasonable clean and tidy manner. Stays of 10 nights or more will enjoy a housekeeping service where linen and towels will be refreshed and quick wipe over is conducted. A small starter pack of amenities such as shampoo, soap, dishwashing liquid, laundry powder, and tea and coffee is provided however once depleted guests must purchase their own items. We are here to assist if you need us but otherwise the place is yours to enjoy undisturbed. Check in is at our office. Sunshine Beach Real Estate is located at 36 Duke Street, Sunshine Beach. Opening Hours are as follows:- Monday – to Friday 8.30am – 5.30pm Saturday ¬-9.00am – 5.00pm Sunday – 10.00am – 3.00pm After hours check in is available upon request and if we are closed upon departure keys can be returned to a safe deposit at the front of our office. Most visitors to Sunshine Beach enjoy the fact that the car can be left in the garage. The shops and restaurants, and the patrolled beach are all a pleasant walk away from the house, with a short cut through the park. If you did wish to do a spot of shopping in the glamorous Hastings Street or enjoy the fine dining, that's a 5 minute drive away. But we think you'll prefer the less touristy and much more laid back enclave of Sunshine Beach.